Marco and Tobias find another entrance into the Yeerk pool, and the Animorphs decide to go in to spy, in hopes of discovering the location of the Kandrona, which keeps the Yeerks alive. They go in as roaches, which it turns out Taxxons like to eat! Just as a Taxxon is about to swallow them, time stops. An Ellimist, a being that exists outside of normal space-time, gives them a choice: continue their fight, and lose, or be taken to a new planet where the human species will be repopulated. In order to convince them, the Ellimist shows the Animorphs a future in which the Yeerks have won. But the more they think about what they've seen, the more they start to question the Ellimist's motives. This was a strong Animorphs book. The one part I took issue with was when they escape from the Taxxons, because it seems like they left a lot of bad guys alive, who presumably saw them morph, so shouldn't their secret be out now? 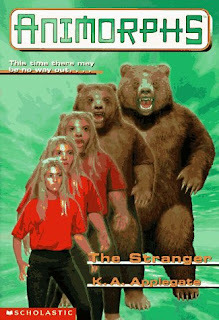 It seems like they would have figured out that the Animorphs were human, not Andalites. So I'm not sure what's going on there. This story ended up being a lot more hopeful than a lot of the books in the series. It's nice to have something good happen sometimes, instead of just always trying crazy plans, nearly getting killed, and having only tiny effects on the Yeerks. This book also counts for the Mount TBR Reading Challenge.